This morning, I was reading in John 9. I love this passage and saw that I had made a one word note in the margin (from an earlier reading): obedience. You will know the story well: Jesus heals a blind man by making a mixture of spittle and clay, which He applies to the eyes of a man who had been blind from birth, and instructs him to go and wash in the pool of Siloam. What does this man do? He does exactly what Jesus told him to do. 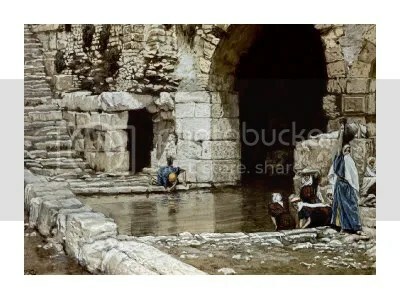 When he goes and washes in the pool of Siloam, his sight is restored. Now, we must realize that his sight was not restored b/c of the clay mixture or the pool; it was restored because this man had enough in faith in Jesus to obey Him. In thinking about this passage this morning, I couldn’t help but wonder if this man had any reservations about obeying the Lord. The Bible doesn’t say if he does or not, but I am thinking that I may not have been so quick to obey. What are some of the objections this man could have made? “But Jesus, I cannot see. How can I journey to the pool of Siloam?” or “but Jesus, do you know how ridiculous I look with this clay on my eyes, surely you are not meaning to send me out like this (what if people mock me? )” or how about “but Jesus, my sandals are not fit for trip there.” Perhaps, he even had fears about obeying Jesus, after all, we learn later in this chapter (v.22) that he would be put out of the synagogue if he confessed Jesus to be Christ, and no one but Christ could work such a miracle. I would like to think that I would have been as bold as this early believer, but I also know how strong the pull of the world is on me at times. Do you ever feel it too? Do you sometimes have fears about obeying Christ and following Him? It isn’t always easy! This reminds of some other words of Jesus that I have found in Scripture, that I come back to over and over: “If you love Me, you will keep My commandments” (John 14:15). In reflecting on the first part of John chapter 9, I am struck with the realization that this early believer REALLY loved Jesus. This blind man put everything on the line in order to obey the Lord! This man did not run from the Word, he did not ignore the Word, he listened and obeyed! Through his obedience, he is blessed beyond belief: for the first time in his entire life, he is no longer blind, but he sees! Today, we face the same choice that this man did. We can be in the Word and obey the Word, or we can simply ignore the scripture, after all, if we do not read the Word, how can we heed the Word? My prayer today is that we would be bold for the Lord, that we would show our love for Him through obedience to His Word. Even if we look different from the world (and even the modern day church), we must only look to Him, through Scripture, and obey. Are you in the Word? Are you soaking it in and asking for Him to take the blinders off of you? Are you willing to step in faith, through the darkness, and obey Him, no matter the cost? In doing so, you are not only showing your love to Christ, you are showing the world your love of Christ. If your heart is truly open to Him, you will not be the same person you were last year (or even last month). Ladies, let us go forth and boldly obey the Lord! This post is very simple to read and its nice that they shared inspiration to us. It’s so inspiration where it drives me to create essay writing today. M adore view, A sizable portion m adore view from the cruise companies help to make the actual Bahamas among their own halts or even “ports associated with call” simply because they have discovered how the people enjoy spending some time right here. Author sharing useful to me! Not only that, the various needs are there, if you are interested in notebook drive can be accessed http://www.mydvddrives.com mainly recommended for everyone 110 this, I hope everyone can enjoy. This man did not run from the Word, he did not ignore the Word, he listened and obeyed! we have a life with God, we have a unique opportunity to live life the way God designed it to be lived. His truth about life will lead us into lives of intense fulfillment and joy. Learning to align our actions with His truth takes obedience. In pondering this section early today, I really wanted to think about whether this man had any reservations about complying with the Lord. The Bible doesn’t say assuming that he does or not, yet I am feeling that I might not have been so brisk to obey. I like the idea of rewarding loyal customers who do business on a regular basis. This kind of concept makes good business sense to me. I have read all the comments and suggestions posted by the visitors for this article are very fine,We will wait for your next article soonly.Thanks! One of the best articles in this world is this. I really love this article. I think that you have produced a wonderful article. Please keep on doing this awesome work. I’d like to see more from you!